Astronaut Randy Bresnik, STS-129 mission specialist, is pictured near a floating beverage container on space shuttle Atlantis on Nov. 17, 2009. It may bethe mother lode of all bad timing: Atlantis shuttle astronaut Randy Bresnik is stuckat the International Space Station, hundreds of miles from his pregnant wifeRebecca, who is expected to give birth to a baby girl as early as today. Bresnik andhis crewmates will spend their Friday hauling cargo between Atlantis and the spacestation, but NASA has set aside some time for the 42-year-old astronaut to callhis wife for updates of his second child?s arrival, mission managers said. ?I thinklike most parents, I would prefer to be there for the birth,? Bresnik saidduring a NASA interview with his wife. ?But you know, we don?t pick this timingand so it?s to be a bit disappointing not to see her in person right when sheenters the world.? Bresnik, aMarine Corps lieutenant colonel from Santa Monica, Calif., is making his firstspaceflight onAtlantis? trip to the International Space Station. Bresnik?s wife works atNASA?s Johnson Space Center and the couple has one adopted son Wyatt, who is 3 1/2 yearsold. Bresnik ispoised to make his first spacewalk on Saturday, so he and Rebecca worked hardto try and arrange their first daughter?s birth around his schedule. Atlantisis delivering tons of spare parts to the space station and due to return homethe day after Thanksgiving. ?I?m justworking with my doctors and working with Randy?s schedule to make sure that, ifpossible, that we can do it on the day where he?s not out doing [a spacewalk]and maybe have a little more communication that day,? Rebecca said before herhusband launched into space on Monday. The birthof Bresnik?s daughter is a welcome miracle for him and his wife, especiallysince they thought Rebecca could not have children, ABC News has reported. Butjust months after adopting Wyatt last year, they learned she was pregnant. ?We?refortunate enough to witness the miracle of adoption as well as the miracle ofchild birth all in one year,? Bresnik said. ?We?re just amazingly blessed.? Bresnik?screwmates said early Friday that theexpectant father ? and indeed all 12 people living on the linked shuttle andspace station ? are excited for the baby?s arrival. Shuttle pilot Barry ?Butch?Wilmore said that Bresnik has managed to remain calm ahead of the baby's birth. ?There?sbeen minimal bouncing, maybe a tad bit,? Wilmore told CBS News via a videolink. ?He?s excited about that, so are we. It?s a great thing to share in thisenvironment.? Bresnik,like all astronauts, is a professional and committed to the mission during hisbaby?s arrival, Wilmore said. Eleven ofthe astronauts aboard theshuttle and station have children, 10 of them are fathers. Astronaut NicoleStott, mother of one son, is returning home next week after more than twomonths at the station. Wilmore said they do plan to celebrate. ?Probablyno cigars, but maybe some chewing gum,? Wilmore said. Smoking and flames arenot allowed on the space station. WhileBresnik is in space, family members are with Rebecca to help her with theupcoming birth. ?We verymuch appreciate what everyone has offered to do with helping us through this,?she said. Bresnik isonly the second American astronaut to be in space when his wife is expected to give birth. AstronautMike Fincke?s second child ? a baby girl named Tarali Paulina ? 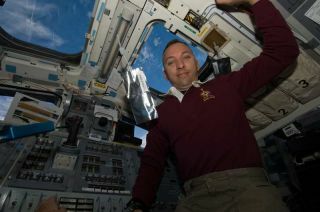 was born whilehe was flying aboard the International Space Station in 2004. Fincke coachedhis wife through the delivery from space using a telephone connection. Shuttlemission flight director Mike Sarafin said this week that Bresnik?s daughter wasdue to be born as early as today, and NASA has taken steps to keep theexpectant dad in the loop. A live communications link to the delivery room ispossible, but depends on timing. ?We do havesome time set aside for him to talk to his wife, as appropriate. We?ll do whatwe need to make that happen,? Sarafin said, adding that the calls would beprivate conferences. ?We?ll just keep our fingers crossed that everything goeswell for them." Bresniksaid he does expect to be able to see videos and photos of the new baby soonafter she is born. But he?ll settle for good news, plain and simple. ?You know,anything we have is far more than most military families get when somebody?sdeployed and they?re not there for the birth,? Bresnik said. ?So if I can get asimple radio call that she?s entered the world safely and Rebecca?s doing great? everything above me on that is gravy. ?